Des now lives in The Midlands but visits Limpsfield at least once a year. He would be pleased to hear from anybody who knows about Broadway. There are more references on Chatterbox so that might be the more appropriate place to post your messages. This way, everbody can read them. At the beginning of 1942 as a soldier serving with the Royal Army Ordnance Corps, I together with other personnel found myself on the station platform of a town called Oxted, we had been posted from Aldershot to 111 Command Ammunition Depot which was situated in-the area. I must confess that up to that time I had never heard of such a place, according to one of my comrades we were somewhere in Surrey and not to far from Croydon. I had of course heard of Croydon and knew it was on the southern outskirts of London. An army vehicle was waiting for us and after what seemed to me a fairly long journey we arrived at a large house, as we disembarked and made our way inside we found that there was a dance in progress. I think the situation came as a surprise to us, as we rather expected to see some sort of camp. We learnt that this was to be our billets and that the house was called 'Broadway' and we were in an area known as Limpsfield Common, the house being situated at the end of Stoneswood Road. We actually spent the first night sleeping on the floor of the ballroom where we had seen the dancing. Next day we were allotted accommodation in rooms in what seemed to be a very large house. Well we all thought it looked like we had landed at a very good spot, because some of the rooms had wash basins with hot and cold running water. Our Commanding Officer was Major H.J. Ellis and 'Broadway' was the HQ of the unit. The actual ammunition depot was over a 1 mile away in Staffhurst Woods. On the Saturday afternoon following our arrival we were off duty and so I decided I would do a bit of exploring around the neighbourhood. I was told there was a town (Oxted) about 1 mile away, so I decided to go and have a look, having got directions I started off. Now it had been snowing heavily for a couple of days and I found it quite a task to walk, considering the state of the roads. After what seemed a very long walk I came to the town, I must say that I was not over impressed by my first encounter, it seemed a very quiet place with nothing to do. I thought maybe there would be a forces canteen, which there usually was, in towns where troops were stationed, but it did not appear so, actually I only ventured as far as the east side of the Railway station and was unaware that there was another part of the town on the other side. I did find a newsagent shop where I attempted to buy a newspaper but all they had was the 'Surrey Mirror'. So after this little adventure I had no alternative but to find my way back to my billets, which involved the steep climb from the town. I was only at 111 C.A.D for about a week, during which time the weather was very bad and I did not venture out. During this first week I was found employment in the Orderly room, which was situated at HQ so I never saw the Depot, then I was posted to a depot near to East Grinstead. During 1943 the depot at East Grinstead closed and I was posted back to 111 C.A.D. On my return I was detailed to work in the Depot office in Staffhurst Woods, which meant a journey to and from there each day. To reach the depot by road from 'Broadway' we had to go via Stoneswood Road, Brick Kiln Lane, Kent Hatch Road, Limpsfield Crossroads, New Road and Pollards Wood Road. The Depot covered a fairly large area and ammunition was stacked in shelters along Red Lane, Merle Common Road, Staffhurst Wood Road, Dwelly Lane and Caterfield Lane. Further stacks of ammunition was positioned in the surrounding woods, I remember thinking when I first saw the Depot what a shame it was that the flowers and shrubs together with some of the trees had been destroyed in order to make room for piles of ammunition. It was in many places still a beautiful and tranquil place and despite all our activities one could find a quiet secluded spot. The Depot office was situated on an Island at the junction of the roads mentioned above, opposite this Island there was a church (Ed. St. Sylvan’s Church) or church hall where we used to take our morning tea break. I believe it was staffed by volunteers from the church. Also, nearby was a little cottage known as 'Comforts Cottage'. This did at one time house members of the Army Fire Service. There were two Public Houses in the area. One was the Royal Oak and the other, whose name I have forgotten, was in Merle Common Road. These were 'out of bounds' to us while on duty. To return now to 'Broadway', it was now summer and things looked a lot different than my previous visit. The view from the house was magnificent. I could see for miles, the countryside looked so beautiful. So different from the views I had in my home town of West Bromwich in the heart of the Midlands. I used to wonder who had lived there before it was taken over by the Army, they must have been a wealthy family. It was a very big house, having I would say about 25 rooms on three floor, including one large room which the unit used as a ballroom, it was also used by E.N.S.A parties who came to give us entertainment, there was also a billiard room with a full size table. In the main entrance hall was a grand staircase leading to the first floor, which incidentally we were not supposed to use, we had to use stairs at the back of the building. A large garden lay to one side of the house and this was reached through an ornamental terrace. Every Friday night the unit held a dance, which was always well attended and local girls made good partners for us, although I was not a dancing man myself I did sometimes go and have a look. 'Broadway' had its own small band made up of unit personnel and its signature tune was the 'Broadway melody'. I sometimes had the job of selling admission tickets and so got to know many of the regular attendees. A lot of the people who attended these dances came from the Hurst Green area, and some from Limpsfield village, I do not think many came from Oxted because of the distance. It was quite easy to get to 'Broadway' from the Hurst Green area because there was a short cut, a pathway led from Pollards Wood Road, otherwise it would have meant a long walk along the roads. Stationed at 'Broadway' had many advantages but unfortunately it was rather isolated. 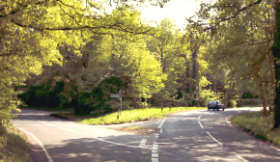 The nearest village was Limpsfield, this was a very small country place. It had a couple of Public Houses, although I never visited one. There was a Public house on a road junction called 'Wolfs corner' this was the Plumbers Arms and was really our local, but again I must say that I think I only ever went there a couple of times. Oxted was I suppose the nearest town, although Westerham was probably just as near, either could be reached by bus. We were rather lucky in some ways that there was a bus service which ran past Limpsfield Common schools, which was not too far to walk if you cut across the common, but if you had to go by road it was much further. This bus service ran either to Reigate (via Oxted) or Bromley (via Westerham). I mentioned earlier that on my first visit to the town it seemed a very quiet place and so it was. On later visits to the town I discovered there was a cinema named the 'Plaza' and a Public House called 'The Hoskins Arms Hotel' (I am not sure if I have spelt this name correctly). I believe that sometimes dances were held there, although I never went to one. Apart from these two venues there was nowhere else to go, as far as I know there was never a forces canteen during my time there. One of the redeeming features of the town was that it enjoyed a good train service up into Croydon and London. We had quite a few servicemen with us who came from the London area and it was very handy for them if they had a weekend pass, as there was a late train back on Sunday night. In 1944 I was made responsible for the Quartermasters stores in the unit which meant that instead of going to the depot I remained at Headquarters in 'Broadway'. Part of my duties involved going into Oxted almost daily, our mail had to be collected from the Post Office, because of security our mail was always addressed c/o G.P.O. Oxted. I also had to go into Job's shop, I remember Mr. Job a man with a mop of white hair, and also to Freeman Hardy Willis who did our boot repairs. There were two establishments in the town that were well patronised by me, and others who managed to visit the town in the daytime. One was the tea shop situated in Station Road West next to either the Post Office or Bank, where we were always made welcome by three sisters who came from London. The other was the small tobacconist shop next door to the cafe, called Askew. Here worked a very kind young lady (I believe she came from Edenbridge) who would when possible keep us some decent cigarettes, occasionally a jar of Brylcream and sometimes some chocolate. Working at Headquarters did have advantages one of which in particular I must mention, we found that there was a cake shop situated in Limpsfield Village that sold the most delicious jam doughnuts and every mid morning we would send someone down to get a supply. One night in 1944 we were woken from our sleep by an unfamiliar sound similar to the noise made by a two-stroke motorcycle engine and looking through the windows we saw what appeared to be a small aeroplane with flames spurting out of the rear. We had a grandstand view as they came over from the south coast, these were the V1's (Flying bombs). We soon discovered that when the engine stopped they would dive to earth exploding on impact. We were fortunate that the nearest one to land near 'Broadway' was in Pains Hill when we were called out to help in rescue work. Another incident occurred when one of the weapons struck a barrage balloon cable and exploded in the air, the wreckage falling into a farmyard within the depot perimeter. There were many other incidents in Oxted and surrounding areas. When later the V2 (rockets) were used by the Germans we were spared any incident as far as our Headquarters and Depot were concerned. As the end of 1944 approached I began to date a local girl. We used to go to the cinema in Oxted and as she lived in the Hurst Green area we would catch the train to Hurst Green Halt. It was a very small station consisting of a wooden platform, with hardly any shelter and we had to travel in the front carriage of the train to enable us to alight. Incidentally I think the fare was about 2d (1p) single. When V.E day came in 1945 I was actually on leave in my home town, so I did not witness any celebrations that maybe took place in Oxted, although I believe the unit held a Victory dance at 'Broadway'. I said farewell to Oxted at the beginning of 1946 when I was posted away, but the Depot still remained operative although it was envisaged that it would soon be closing, a lot of ammunition having already been cleared from the site. After I was discharged from service and returned home I often thought how lucky I had been to have been stationed in this country throughout the war and with such a comfortable billet. Whenever the name of Oxted was mentioned in the media it always brought back memories and then some years back I made contact with someone who I had known during my time there in the 1940's. As a result I was invited to visit them, although they had moved to Godstone, I was able to make several nostalgic journeys to Oxted. One of first places I made for was 'Broadway' which I found had been converted into flats. As regards the Depot site, this had returned to its natural state and was now part of the glorious countryside with no sign of its wartime use. There was of course some alterations to Oxted town. Job's shop had moved and both the tea shop and tobacconist had gone. So had the Hoskins Arms, although the Plaza was still there. During one of my visits I was also able to meet an ex-comrade who I knew as S/Sgt. L. Barber (nicknamed - Ali) who had served with me in the R.A.O.C. Apparently he had married a local girl and had stayed in the area. Unfortunately I was only able to meet him once, as he passed away soon after our re-union. I believe there is another ex-comrade in the Oxted area by the name of Thompson but I have been unable to trace him. I now visit the area quite regularly and have witnessed many changes there over the years.